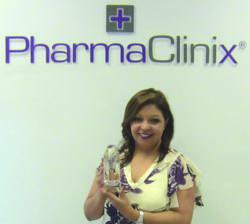 Shashi Gossain receives HSBC Power Business Woman Award for her luxury skin care brand, “PharmaClinix®”. A very big thank you to all the Stockist, Distributers and Wholesalers around the globe for enabling Pharmaclinix® to grow from strength to strength, off-course not forgetting all the support of my family and friends. Shashi Gossain, Director of Pharmaclinix® Ltd, has won the prestigious, “Business woman of the Year” award at the HSBC English-Asian Awards, held on 6th March, in Manchester. The award was for the recognition of her innovative & advanced cosmeceutical skin care, under the brand name, “PharmaClinix®” that she has founded & made available in 26 countries worldwide. Shashi Gossain, who is a Pharmacist & Cosmetic scientist, was declared the winner after facing tough competition from other established companies. Shashi has spent the last 10 years developing, Pharmaclinix® a premium range of skin care especially for the Asian and Darker skin tones, which has now become a household name. She found a niche in the market, as there were no products that were specifically formulated to address the particular problems associated with Asian skin, which is susceptible to the effects of the sun causing patchy darkening of the skin, scarring and dark rings under the eyes. Since most middle-aged, Asian women had not been in the habit of looking after their skin with a proper skin care routine, she found it particularly challenging to persuade them, the change has been quite an achievement! Shashi has taken Pharmaclinix® to the international market, by participating in all major Aesthetic conferences & exhibitions, through which her formulations & branding have become synonymous with professional skin care, which is recommended by leading Cosmetic dermatologists around the world. Shashi insists that the success of Pharmaclinix® as a major brand is due to the hard work of her team, and the distributors who have recognised the unique concept, which is particularly appealing to the emerging markets. Shashi was born in Kenya & immigrated to the UK in 1971. During her secondary schooling & university years, she worked in various retail establishments in the Health & Beauty sectors. She dreamed of having her own brand of skin care, which she has achieved through sheer dedication to work. There are over 40 products in the range, each one developed for a specific condition and for a targeted skin type. Pharmaclinix® is often associated with major beauty pageants, Asian wedding exhibitions and Bollywood sponsorships, through which the luxury brand has been introduced to prominent Bollywood actors, the Royal families of Saudi Arabia, Kuwait & UAE- who are now loyal to the Pharmaclinix® brand. Shashi has also written many books on Health & Beauty, including, “The Ultimate Anti- Ageing Handbook”, which has now become a best seller. Pharmaclinix® skin care is now available in over 10,000 retail outlets, with a lot more launches planned in the coming year.